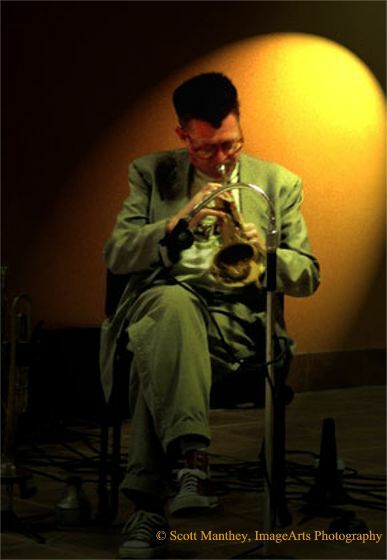 As a trumpet player, I have a reputation for eclecticism and originality springing from a desire to play the trumpet in a definitely "un-trumpetish" fashion.As far as Jazz goes I'm indebted mainly to saxophonists- Ornette Coleman, Paul Desmond, Stan Getz, and Eric Dolphy. Of course, who could disregard past and present trumpet geniuses such as Louis Armstrong, Cootie Williams, Henry "Red" Allen, Ruby Braff, Miles Davis, Don Cherry, Freddy Webster, Booker Little, Art Farmer, Barbara Donald, and others. This has not always been an advantage from a career standpoint. I'm usually considered a little too out for the Ins and a little too in for the Outs, but that's just where I want to be. I've performed and/or recorded with Paul Rucker, Roger Baird, Michael Bisio, Daniel Carter, Vinnie Golia, Andrew Hill, Robin Holcomb, Wayne Horvitz, William Parker, Perry Robinson, Dave Storrs, Michael Vlatkovich, Dina Blade, and Lynette Westendorf. I was raised in a Midwestern fundamentalist religion. Some of my earliest musical memories are of revival-meeting piano players raising the crowd seemingly several feet from the floor. I've always felt the best musically when I'm a sort of conduit for something inexplicable - it's like the music grabs me by the scruff of the neck and we're gone. "Music for a Tired Empire" on the "Downloads" page.